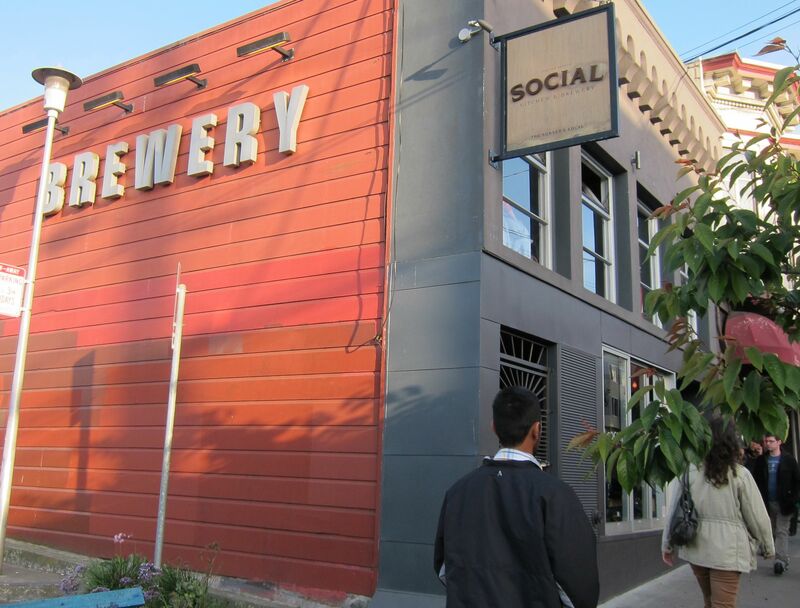 Social Kitchen is located near Golden Gate Park, where the N-Judah MUNI line crosses 9th Avenue. This stylish brew pub, on a much improved site operated by a string of other pub businesses in years past, opened in the Spring of 2010. Beer is brewed in the mezzanine-level brewery. There is TV to show sports events with no sound. But Social does not have a sports bar vibe. Extras: Golden Gate Park is a few blocks north. You could wander through the park and down the park panhandle then cut over to Magnolia Pub for the next stop. Arrive at Civic Center BART, go up to the fare gate level within the station, exit BART and then enter the SF MUNI system. Take MUNI route N-Judah Outbound. The trip is about 3.4 miles and takes about 17 minutes. Your light rail vehicle will emerge from underground, then go through a tunnel, and take a few turns as you approach the numbered avenues. Get off at 9th Avenue. Social Kitchen is south just half a block. Official BART Civic Center Station and connecting transit info.